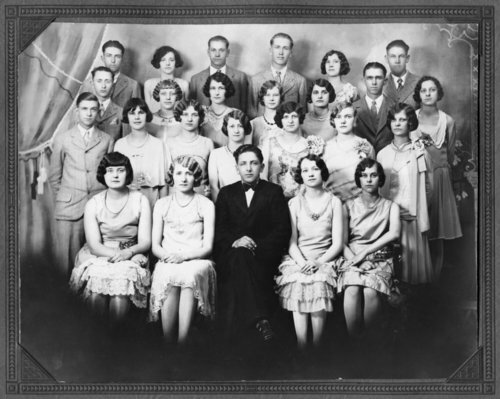 Photograph of members of the graduating class of 1928 at Alma High School in Alma, Kansas. They are identified as (first row, left to right) Eleanor Kraus, Esther Mathies, Charles Lott, Mabel Brasche, Julia Diepenbrock; (second row, left to right) Floyd Christy, Gertrude Schmitt, Marie Thowe, Doris Schwanke, Mildred Carpenter (sponsor), Florence Zeckser, Helen Johnson; (third row, left to right) Gilbert Bandel, Alma Hitgemann, Genevieve Haller, Alvina Tenbrink, Audria Schreiber, Raymond Dallas, Selena Feiden; (back row, left to right) Arnold Ringel, Ruth Gustin, Harold Steinmeyer, Leroy Horne, Blanche Lowe, Alvin Hasenbank. Not shown is Cynthia Todd.